I tried a Yumi’s beetroot dip recently. Many of the beetroot dips you can buy are not vegan but this one was. Normally I’m not a big fan of beetroot dips, but I liked this one so much I wanted to try to recreate it. As luck would have it, I had a stack of beetroot from a garden produce swap with a friend so I roasted them and made this dip. I’m not sure if it replicates the Yumi’s one or not because I don’t have any left to compare. But it is delicious anyway. Roast the beetroot and garlic in the oven at 180ºC / 350ºF until the beetroot is soft. 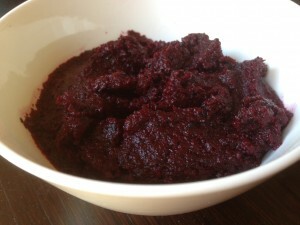 Drop the beetroot and squeeze the roasted garlic paste (discard the skins) into the food processor. Add the cumin and pulse. Add up to a tablespoon of oil and blend until a rough paste. You still want some texture. Add the salt and lemon to taste. There are a couple of ways to roast beetroot. You can either roast it whole, unpeeled and slip the skin off when done, or peel it and cut into chunks. The latter way caramelises the beetroot and this is the method I've used here because it tastes so good in this dip. One thing though, you have to be vigilant when cooking it this way. There is so much sugar in the beetroot that it can burn easily.